At home in all situations, the Unimog has more than one strength, even in winter. It is the master of winter viability thanks to its power and its high GVW. 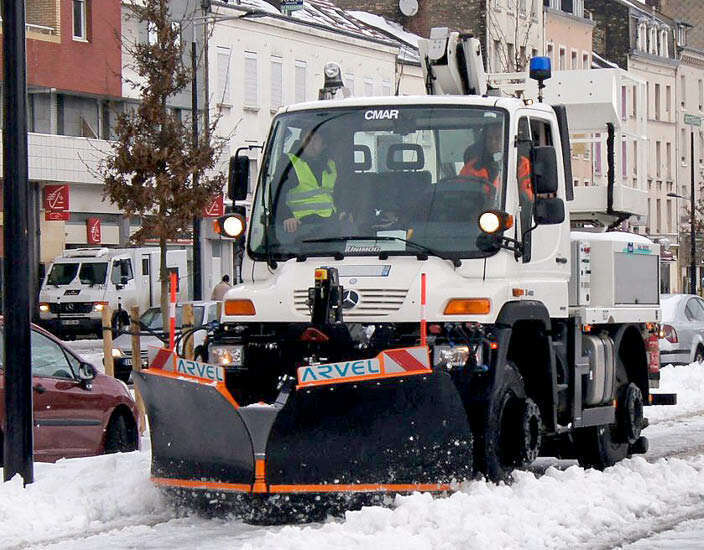 It can be fitted with 4 m³ salters, including with brine, and 3.60 m snow plough blades. Its front power take-off drives snow cutters or high power turbo-cutters. Brine spreaders and brine plants can also be fitted on the Unimog. 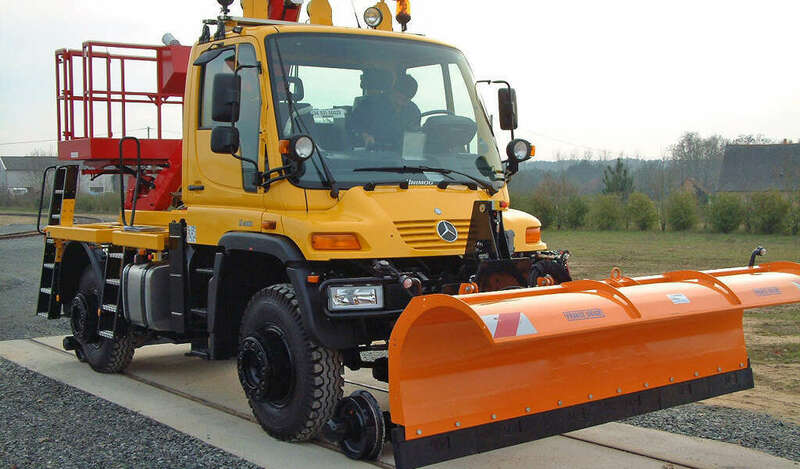 Therefore, using a Unimog very interesting snow clearance output can be achieved. Unimog is effective and shines in the tool carrier sector. leading edge technology from the series, a perfected concept and new know-how: its flexibility is based on an effective chassis. Unimog performances: the available engines deliver up to 220 kW (300 hp). The gearbox is more efficient using functional gear ranges. The improved VarioPower(R) power hydraulics allows increased productivity. The proportional control working hydraulics allows precise tool control. The maximum speed is 90 km/h. Delivering the energy required for over 1000 different applications. Unimog makes it possible to change tools and items of equipment in a few moments. Unimog has a fast equipment and tool uncoupling system. With its multiple capacities and its four assembly and fixing points, the new Unimog can be used all year round, as much at home with brush clearance work as with winter work. 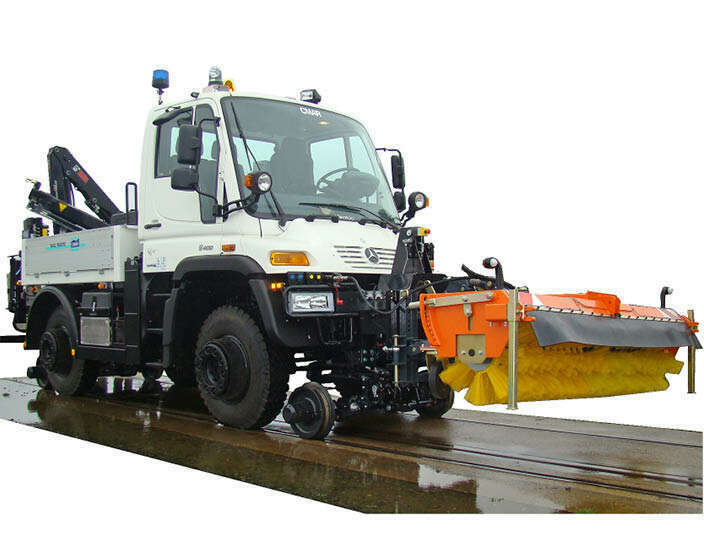 The vehicle can support snow clearance blades, salt spreaders, brine stations, snow cutters and snow sweepers. Unimog is economic and is an investment for the future. Through its extreme potential, adaptable to all terrains and all situations, the tool carrying Unimog is the enemy of snow covered roads. You will no longer be taken unaware: the snow clearance tool will be ready as soon as the first snowflakes begin to fall. Multi-purpose vehicle usable all year round, with over 1000 possible applications. Low fuel, AdBlue and engine oil consumption. Ultramodern Mercedes-Benz propulsion technology that is effective and proven in mass production. Low maintenance cost due to the reduced maintenance frequency. New, easy-to-maintain cooling system. Powerful top-end engine brake. Excellent corrosion protection. Unimog is ecological to protect the future. Unimog is developing a new generation of clean motorisations: BlueEFFICIENCY Power compliant with the Euro VI pollution standards. This technology drastically reduces emissions and particles by up to 90% compared to the previous Euro V engines. CMAR, a cleaning specialist, knows how to adapt a water tank and a front cleaning bar, to convert the Unimog into a cleaner.